Posted April 29, 2015 by Marisa Hess & filed under Holiday, News. 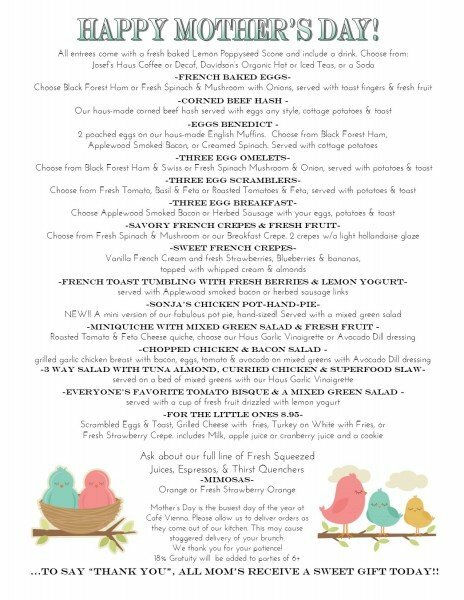 There are so many delicious choices on our Mother’s Day Brunch menu, you’ll have a hard time choosing. It will be fixed price menu that includes a Lemon Poppyseed Scone, your choice of Coffee, Iced or hot Tea, or a Soda. It will also include a sweet little treat for all Moms. Our decadent French Baked Eggs with Black Forest Ham is served with Sourdough toast fingers and a cup of seasonal fresh fruit. You may know them as Oeuf en Cocotte, but I think we can all agree, “Baked Eggs” is easier on the tongue. Have you ever had our crepes? They are delightfully thin, eggy pancakes. Choose from 2 crepes filled with sauteed Fresh Spinach and Mushrooms or wrapped around eggs scrambled with our Applewood smoked bacon, swiss cheese, & bell peppers. Or go sweet, and have them filled with our luscious vanilla French Cream and fresh strawberries, blueberries & bananas. If you aren’t in the mood for breakfast, we’ve got you covered too. Try our Chopped Chicken & Bacon Salad, which is full of mixed greens, grilled garlic chicken breast, bacon, hard boiled eggs, tomato and avocado. We dress it with our Avocado Dill Dressing that we make right here in our kitchen, and you’re going to love it! But probably the most exciting entree on our menu is our new Chicken Pot-Hand-Pie. If you’ve ever ordered Sonja’s Chicken Pot Pie, you know how delicious and HUGE it is. Well, we are offering it in a hand-pie size. And believe me, once you get your hands on it, you’ll be coming back for more! We are serving it with our Mixed Green Salad and haus Garlic Vinaigrette. So make plans for your Mother’s Day Brunch at CAFE VIENNA! You’ll see all the familiar faces taking orders, Galina will make you a fluffy cappuccino, and our kitchen will be working hard, churning out those plates. We are encouraging reservations for parties of 5 or more, as it’s the busiest day of the year in our cafe. So call us today 775-825-0451.